Become a Friend: Join Today! The Friends work closely with the Park Service to fund critical park needs not covered by the state. Members of the FOF can be seen greeting visitors at the boardwalk, clearing trails, leading swamp walks, conducting tram tours and hosting events from fund-raisers to Kids fishing clinics and so much more. Members of the Friends of Fakahatchee join for many different reasons; some may have had a special experience in the Preserve and want to say thank you, many are conservationists who want to support our mission, while others seek to be actively involved as volunteers within the park or serve on our board of directors. They receive our members’ newsletter, The Ghost Writer, which helps them keep up with events in the swamp even when they’re up north. This newsletter also features informative natural history articles on the Fakahatchee’s unique ecology, and updates on projects aimed at its preservation. Members also get advance notice of opportunities to assist with research and conservation projects. 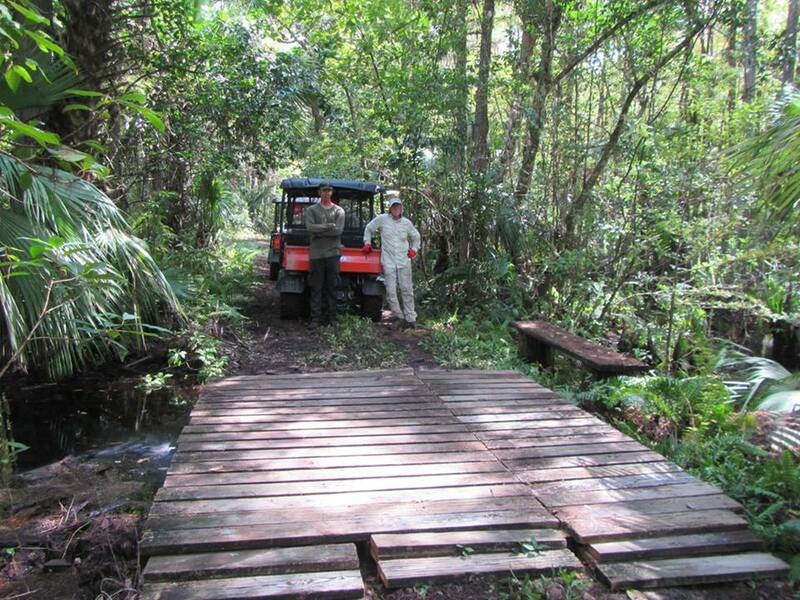 They enjoy educational evening programs each season, the annual picnic and other social events, but above all they share the fellowship of like-minded individuals; all doing their bit to help preserve one of the last undeveloped wilderness areas in Florida. Faka-hackers Howard Lubel, Dino Barone, and Ranger, Steven Bass constructed a new bridge over a collapsed culvert on the West Main Tram. Whether you contribute “on the ground” or through your generous financial support, we want you as a Friend. Through membership, you will gain access to, and knowledge about, one of the richest and rarest ecosystems in the United States. Won’t you join us?!? “I see the Friends as an extremely dedicated group working to preserve an incredible wilderness and its wildlife. I am very proud to be a member. Thanks to our lifetime and business members! A COPY OF THE OFFICIAL REGISTRATION AND FINANCIAL INFORMATION FOR THE FRIENDS OF FAKAHATCHEE, A FLORIDA-BASED NONPROFIT CORPORATION (REGISTRATION NO. CH9223), MAY BE OBTAINED FROM THE DIVISION OF CONSUMER SERVICES BY CALLING TOLL-FREE 1-800-HELP-FLA (435-7352) WITHIN THE STATE OR VISITING THEIR WEBSITE HERE. REGISTRATION DOES NOT IMPLY ENDORSEMENT, APPROVAL, OR RECOMMENDATION BY THE STATE.